If you think making jam is too complicated, try this! It’s a simple case of adding the ingredients and letting them do their thing. Created by Chris Roberts of Roots at Waterfall SUPERSPAR, this recipe is great for those following a wheat-free diet. Combine all ingredients in a small pot and simmer until soft and thickened. Preheat oven to 180 degrees. Brush the bread with butter and bake in oven until crispy. 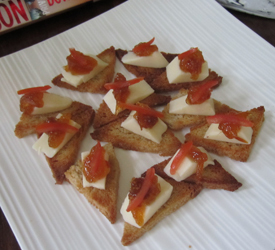 Place cheese on toast points with a drop of gooseberry jam. Simple as that! For more foodie news and recipes, click here.